This entry was posted on May 23, 2017 at 7:45 pm and is filed under Giorgio Bassani. You can follow any responses to this entry through the RSS 2.0 feed. You can leave a response, or trackback from your own site. It’s a wonderfully evocative book, isn’t it? Very elegiac, as you say. Yes, its atmosphere is one of its most striking features. Great review as ever, Grant. Yes, I agree with your closing comments around the importance of remembering the Finzi-Continis and the many thousands of other Jews who perished at the hands of the Nazis during WW2. The prologue sets it up nicely, I think. Perhaps it’s difficult to love because it’s quite an uncomfortable book – it’s difficult to be entirely on either side of the unrequited love story. Even the unexplained survival of the narrator as opposed to the Finzi-Continis is slightly unsettling. I’m loving all of your reviews of this novel, which I remember with great fondness – perhaps because I read it at an impressionable age. I can see why it would make an impression if you were the same age as the characters – I thought much of their awkward relationship rang true! I love the connection with the Etruscans! Great review, Grant. Ha – I’m glad I picked that out then! I must admit – and I’d be interested how others feel – I sometimes neglect to connect Italy with the ancient world. And I really like what you say in response to Jacqui–it *is* an uncomfortable book, exactly because we’re not easily allowed to sympathize with anyone, in my opinion. Do you remember anything about the Quigly translation? It doesn’t get discussed much. I’ve nothing to compare it with but I thought it read well. It does produce the local dialect in the original with footnotes (as well as footnoting when the original is in English)- I don’t know what the other translations do. I must get my copy off the shelf. The gloomy subject matter has made me reluctant but I’m all for style elegiac atmosphere, and your review inspires me. It is melancholic but I wouldn’t describe it as depressing. “A surfeit of longing” – that’s such an apt way to put it. I’d forgotten the narrator’s fantasy about Micòl administering to him if he elected to stay hidden in the darkness of the old munitions cache – a very telling snapshot of his psychology (next time through I should pay more attention to his fantasies and dreams). 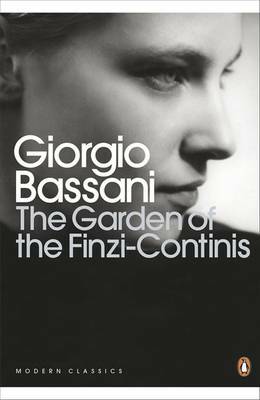 I also like your comment about “political pacifism…a disinterested desire to step outside history.” Part of my struggle to understand the Finzi-Contini family is that they seem to serve symbolic roles in addition to their flesh and blood ones – a feat that Bassani pulls off beautifully. They exist a bit outside of time and place, at various points encompassing nearly all of the branches of Judaism we understand to be present in Ferrara (except for one poor and even more isolated small community), and possessing a strangely international quality, part Italian, part German, part Spanish, all “Finzi-Continian.” And then the tomb is also described with the “incredible pastiche” of global historical elements. The dream-like quality of the “garden” also conveys their slight irreality. Apropos that last thought, it seems telling that the scenes with the most reciprocated intimacy are the ones between the narrator and Malnate in the last part of the book. Scott, somewhere (in an email to me? in your responses to my post? I forget!) you said something about a reference in the book to a homosexual scene in another work by Bassani. I’m curious to hear more (whether from you or anyone else) about how queerness fits into Garden. Thanks for the comment – and the excellent read-along choice. I hadn’t really considered the Finzi-Continis internationalism, simply associating it with their wealth, but its connection to the description of the tomb makes it seem important. In a time of nationalism, internationalism was also under siege I suppose. Dorian – I haven’t quite figured out how queerness fits into Garden, but the inclusion (p. 222 in the Everyman’s Library edition) of an allusion to Bassani’s 1960 novel The Gold Rimmed Spectacles, a novel the details the destruction of a homosexual doctor through a similar depiction of the incremental indignities of the Racial Laws, is puzzling here. It reveals the narrator taking a stance that “love justifies and sanctifies everything, even homosexuality,”, which he contrasts to Malnate’s “very simple ideas: like a true goy,” that homosexuals are pitiable “creatures.” This may simply be a way for the narrator to justify his obnoxiously fawning behavior towards Micòl, but I thought it might also be a suggestion of the narrator’s own latent homosexuality, particularly since when we see him in 1957 he is alone, and in fact once again cut off from a family – this time by the front seat of a car rather than a wall. Oops, sorry, the translation of Gold-Rimmed Spectacles was 1960; the book appeared in Italy in 1958.